I’ve discovered the secret to making me want- nay, crave– salad. Yes, really. If you give me a tiny salad plate with a couple wilted greens and watery tomatoes, I’ll turn my nose up. 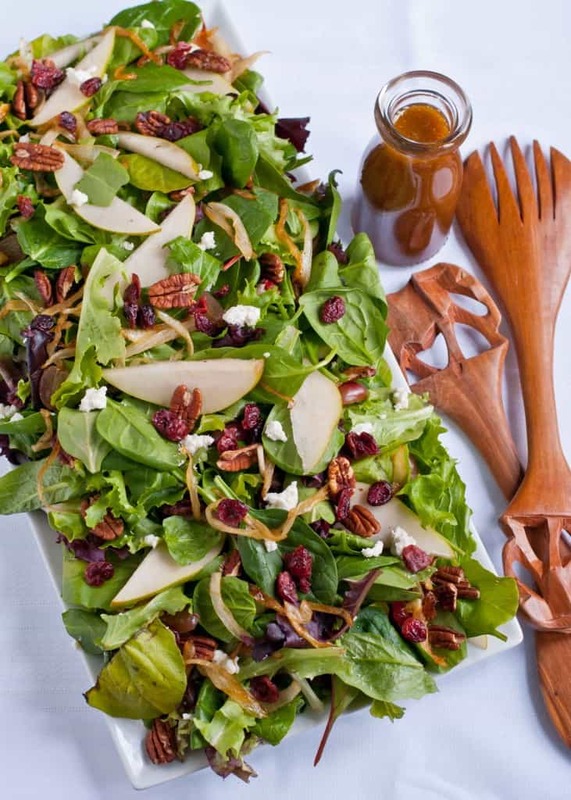 But if you pile a gigantic platter with greens, dried fruit, nuts, and goat cheese? Well, I’ll grab a fork and proceed to eat my weight in leafy greens. This is a salad that I crave. It’s packed with goodies like dried cranberries, pear, grapes, and pecans, but the real stunner is the caramelized onions. Why, oh whyyyy(???! ), have I never added caramelized onions to a salad before? They have just the right depth and richness to ground this salad. The onions take what could be a summery side dish and make it feel perfectly at home in the dead of winter. And the maple vinaigrette? Well, that’s just icing on the cake dressing on the salad. 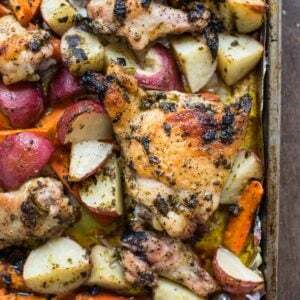 I discovered this recipe in the book Bread & Wine: A Love Letter to Life Around the Table by Shauna Neiquist. If you haven’t read it yet, add it to your 2014 bucket list, because it is fantastic. Filled with stories and recipes, this book is so incredibly inviting and relatable. You’ll laugh, you’ll cry, you’ll find a recipe for bacon wrapped stuffed dates that’ll make you the star of every party. Reading Bread and Wine is like meeting a good friend for coffee, sharing an afternoon of meaningful conversation, and then leaving with their very best recipes. How’s that for a triple win? Shauna tells me this salad comes from a restaurant in Grand Rapids called The Green Well. I’ve never been to the restaurant, so I couldn’t tel you how close this one comes to the original. All I know is, this salad is all I wanted to eat for three days in a row. 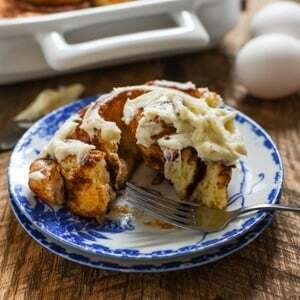 This recipe, like so many others in Shauna’s book, strikes the perfect balance between fancy and cozy. It’s elegant enough to serve at a dinner party (which I did), but not so pretentious it makes people worry about which fork to use. And, since it’s gluten free and vegetarian it can please the toughest of crowds. So pile this stuff on a giant platter, invite a few friends over, and share a meal at the table. It’ll cure the worst winter blues. Heat a Tablespoon of olive oil in a skillet over medium heat. Add the thinly sliced onion, toss to coat, and cook for 30-40 minutes, or until the onion is soft and caramel brown. Set onions aside on a plate. In a dry skillet over medium high heat, toast the pecans for 5-7 minutes or until slightly browned and fragrant. Remove from heat. 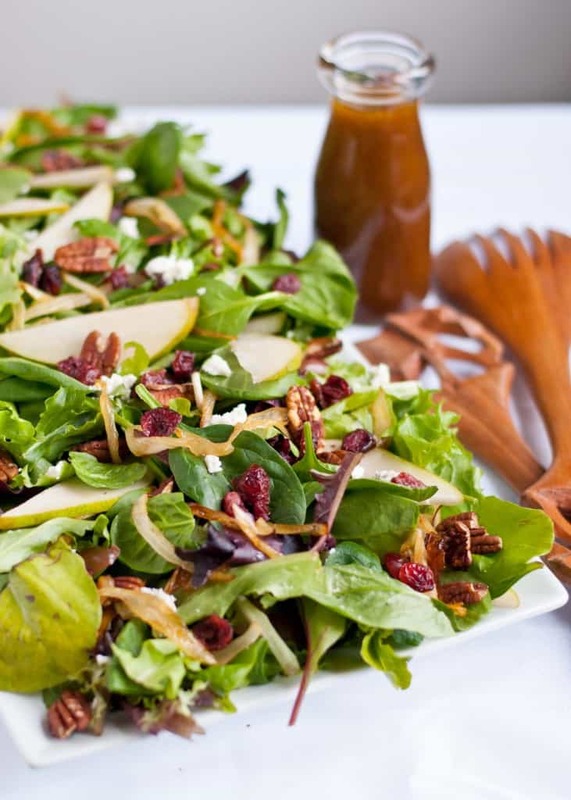 Toss together the greens, caramelized onions, pecans, pear, grapes, cranberries and goat cheese. To make the vinaigrette, place all ingredients but the olive oil in a jelly jar, seal, and shake until well combined. Add the oil and shake again until smooth. 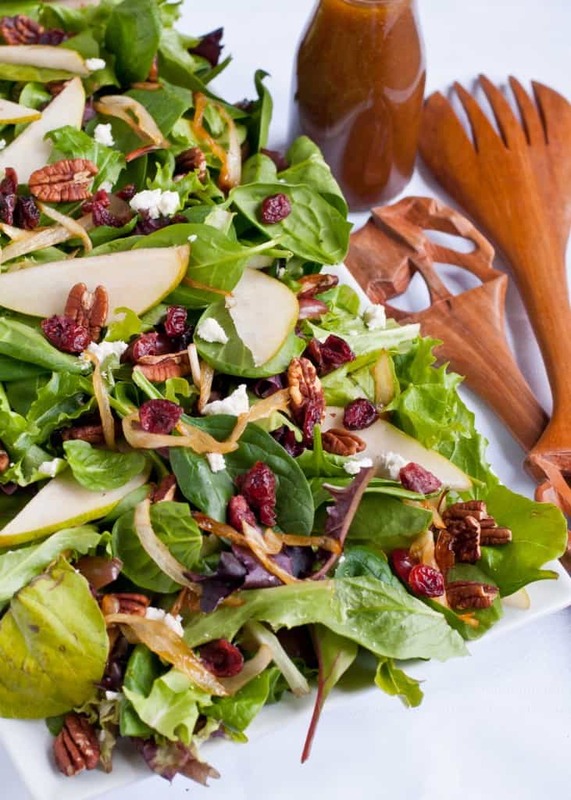 This salad has all of my favorite winter things (ok, life things) added- the pecans, the caramelized onions, the goat cheese! I’m usually a total four year old when it comes to salads and have to force myself to eat it, but I doubt I’d have any troubles with this one. Me too. It’s not usually my thing, except at restaurants for some reason. I always want a side salad before my entree at steak houses. This is a salad I totally crave though. I want to face plant into this yummy salad. That is all. Totally acceptable. Come face plant at my house any time. Wow – what a great looking Salad. Pinning this one. Thanks so much! Hope you love it as much as we do! Me too! I crave it! Thanks for stopping by! Congrats on the Top9!! This looks amazing! I love finding new, creative salads. This has so much fabulous salad junk in it, I can barely wait to try it. I feel like avocado would tip it over the edge to hearty main dish, too! Thanks so much! Avocado would definitely put it over the top! Totally dreamy. Coming right up my dear! Just tried the salad. Really good dressing and terrific ingredients. The onions didn’t need that long to cook, though…10 minutes seemed plenty. I’m so glad you enjoyed the salad! Thanks for coming back to let me know!